Make Receiving eTranscripts Completely Touch-Free. Paper can tear. Mail gets lost. Every delay costs your institution students. With the hundreds of documents that do arrive each day, enrollment goals start to feel overwhelming. Insert Parchment. 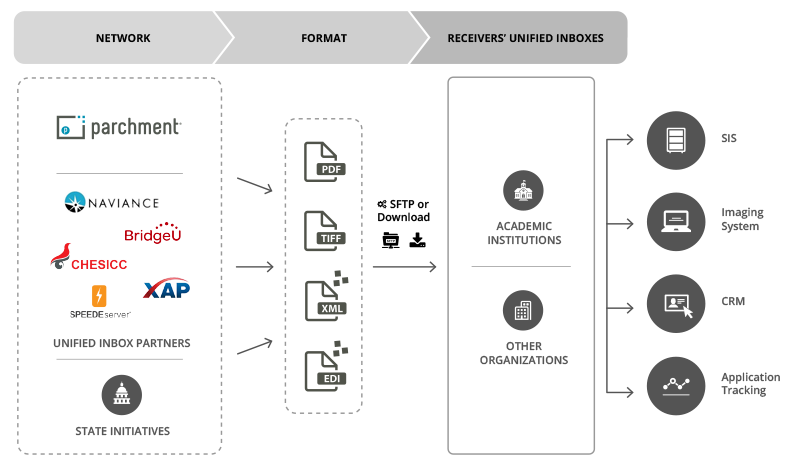 By partnering with the company that thousands of sending institutions and millions of students already trust, you can collect all of your documents in one Unified Inbox and setup automated Routing & Filters. Say goodbye to School Profiles. Parchment Receive was built to make your process touch-free. One inbox to rule them all! Shared by all admins, collect electronic transcripts directly from staff emails, Parchment Senders, Naviance, SPEEDE, XAP, BridgeU, GED and more. Your volume, automation preference and industry all determine the right Receive License for you. Don't settle for out-of-the-box when we know your office is one of a kind. While we're a small part of your day, you're at the center of ours. From a dedicated Account Executive to an entire Support Team and regional Connect events, we're here if you need help. From ECM connectors to continuous SFTP feature updates, you won't have to think twice about receiving records. Focus on other things, our automation is like magic. It just happens. Like Receive? You'll Love Analyze. Don’t deal with multiple vendors when you can have one partner. 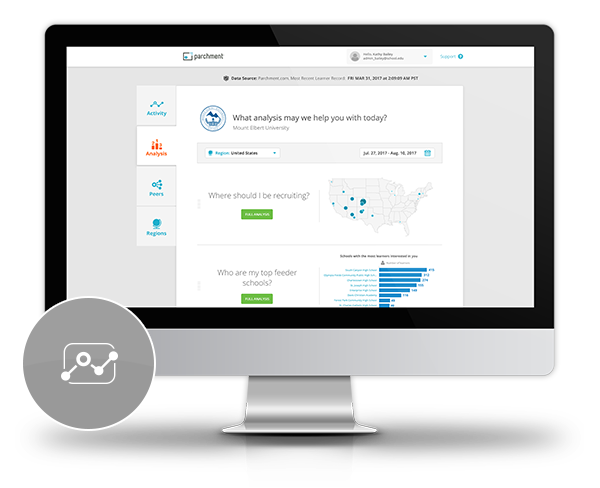 Parchment Analyze arms you with the student recruitment data you deserve.